Not many people realize that half the job in a collection or in any art form is references. References can be nearly everything that is in any way related to our subject. Lists with flats available, information about history of a certain figure, about the history of what this certain figure represents, its place in space and time, all have a value in the mental process of collecting and painting flat figures. 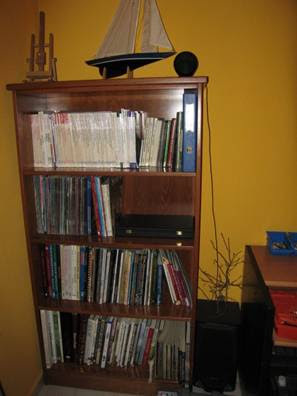 Left: One of author’s bookcases. Good and plenty of references can make our living much easier when we paint flat figures. One can give several examples of the importance of good and plentiful references for a subject. Through time human civilization evolved from the Stone Age to our present, highly sophisticated day. Accordingly, the everyday items we use were evolved too, both civilian and military. Different colors through ages, with some civilizations even have favorites like for e.g. Egyptians and turquoise, or Greeks with white, red and purple and so on (See later chapters). When we want to accurately depict of a soldier that fought in Waterloo we need to know how he was dressed, what he was wearing, what he was carrying, even what season of the year was because everything has an effect on our tiny figure. Once someone understand the importance of the reference material then can start thinking where and how he or she can find all these information. Books and magazines are the easiest answer. There are three kinds of books a flat figure painter would need. First, books (and magazines) about the actual historical period that the flat figure depicts. Books about different techniques that can be used to finish the figure and last, general books about art, always useful as a source of inspiration and lessons in painting or sculpting. Internet can be a very powerful and effective tool to collect such information, most of the times for free. In fact, some people say that it’s nearly infinite, so much information on a particular subject that sometimes becomes a problem of how to filter all this information. There are sites for every subject and with a little patience one can collect everything that is needed even for the most accurate representations of that subject. My own experience has showed me that a book, a specialized magazine or an article stored, is never a waste of money and time. It’s very probable that you will need it sooner or later. Maybe it is a general story about life in that particular era or maybe a small detail of the armament, which by adding it, will accurately represents what was actually used. Or maybe a facial or somatic feature that was so distinctive about that personality we will start painting that even by looking at it someone will say: “ah yes, this hand into this waistcoat can belong only to one person, Napoleon”. After all no one would want his Egyptians palace slave girls to have nice blond hair! But even if you are not a “detail fanatic”, it’s more than sure that good references will have their use in time. So my small hobby library consists of books, articles and photos exactly of the above three mentioned categories. I have intentionally left out of counting a fourth category of books and internet sites. This is the one that consists of photographs of the actual painted figures. Please, don’t make the mistake to reject a photographic portfolio from a show simply because it doesn’t contain any photo of flat figures. Every, and I mean every photo of a painted figure can be of tremendous value as a reference. Even if it’s not in our particular period of interest, it can be useful to observe different painting effects, or approaches of a certain subject by different artists. Or simply because we don’t know what subject will intrigue us in the future. It could be useful even as pure inspiration for our next project, even if we don’t know it beforehand. Collect all possible books and magazines with photos of painted figures in it. Round and flat ones. Collect even the bad ones. Even these can be of a value to us of what to avoid or not to do in our own figure. In the appendix 2 I have listed all those books I collected through time and found useful in one way or another. Most of them will be “technical” books of how to paint, highlight and shade and so on. Some other are listed because I consider them very useful for the history they provide or simply because I got something out of them. Inspiration, entertainment or knowledge. Also, some of the links provided in Appendix 1 can open forums, or homepages of artists that share historical or technical information. 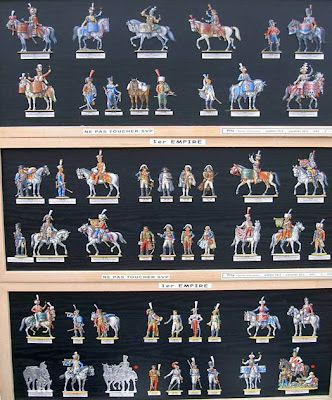 Collection of painted and unpainted flat figures by the French Quadriconcept. While perhaps covered under your category above of techniques (how to paint) I have found that books about the old masters and their techniques are a tremendous help when painting flats.